Follow our journey! This timeline is subject to change. 10.4.18: We are excited to share the floor plan for our new elementary school. This design uses Extended Learning Areas (ELAs), in lieu of traditional hallway space, where students can collaborate and work in a comfortable environment. We have also included small group rooms between classrooms for additional flexibility. The Board of Education approved the schematic design of the building on September 27. The design team is currently working through the design development phase, which includes selecting fixed and loose furnishings. The building is targeted for an August 2020 opening. 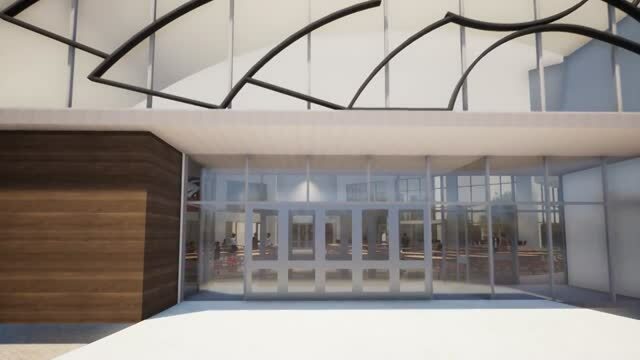 Enjoy this glimpse into a concept of the entry of our new HS! As you enter the front doors, you will be in our multipurpose commons area. This space was intentionally designed to have multiple uses. It can be used for student dining, dances, and as a lobby, for example. From the commons, you can look out into a courtyard that can be used for classes or dining. This courtyard can also be enclosed to increase the size of the student dining area if additional students are added in the future. From the general commons area, you will pass into the academic commons. This space includes a learning/presentation staircase, library books that are housed behind the stairs, and lots of spaces for students to collaborate. You can also see the three-story academic area at the rear of the academic commons. As you exit back through the commons, you can see people walking on the elevated track over the main gym. In our current HS, athletes run the hallways and stairs in the winter months for conditioning, so this will be a great addition to help with safety and efficiency of training. Please keep in mind that we have not selected colors or other design elements. These spaces will most likely change as the design evolves.